I have been an artist all of my life, painting, drawing, and crafting things by hand. While in college I took extensive classes in the arts including jewelry making. 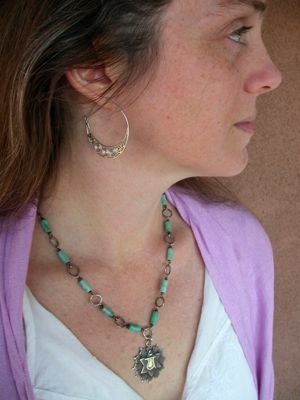 After graduating with a BA in Anthropology in 1994, I decided to pursue jewelry making as a career, incorporating my love of ancient and ethnic cultures into the designing of my pieces. My jewelry reflects my studies in Anthropology with a focus on spiritual symbols that are found throughout the world in many different cultures. Together with the metals and stones of our planet and the symbols of our cultures, I seek to create jewelry that holds meaning and potential healing properties for the wearer, something more and more people are interested in these days. I design and create each piece by hand from the chains to the clasps and earwires with an emphasis on quality for the contemporary woman or man. I have been making jewelry professionally since 1996 both for myself and other jewelry companies. In 2002-2003 I designed and made jewelry for Sundance, while working at Peyote Bird Designs. I live and work on a small farm just north of Santa Fe in the beautiful Pojoaque Valley, a tri-cultural community rich in history and artists. My jewelry is currently represented in Santa Fe at Barbara Bowles Fine Art, BODY of Santa Fe, and the boutique at Encantado, an auberge resort. In my quest for knowledge I have recently discovered the chakra system and have a chakra line of necklaces with the Sanskrit symbols and corresponding lotus flower. In addition I have started a teacher training program in Kundalini Yoga which deals directly with the chakra system, an ancient knowledge of the human body's energy centers. My jewelry is always evolving as I continue to challenge myself as an artist, craftsperson, and healer.